Confederate agents planned a desperate act of terrorism in New York City for Election Day, 1864. Fortunately, their plot was aborted by good Union intelligence and bad Confederate planning. 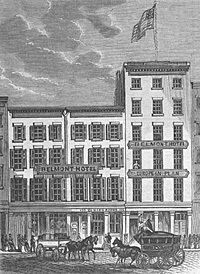 The plot had been hatched by Confederate Lieutenant Colonel Robert Martin, who wanted to disrupt elections by firebombing the city’s hotels. But when Martin and his Confederates arrived in New York City, they were chagrined to find that the city was overrun by Union troops sent there to guard again any rebel skullduggery. The Union general in charge was Benjamin Butler, whose harsh tactics while military governor in New Orleans had earned him the title “Beast Butler.” He was not a great field general but he was not a military governor to be trifled with. 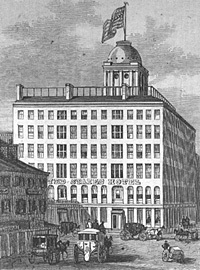 And Butler’s headquarters was in the Fifth Avenue Hotel, the same hotel where Martin and at least one of his lieutenants was staying. 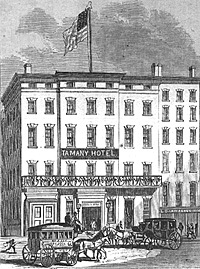 During November 1864, New York City was targeted for more than once a terrorist attack by Confederate agents. The Lincoln administration knew about the plot because it had read communications being carried North by a Union double agent who regularly carried messages between Richmond and Canada — after first showing their contents to the War Department. It wasn’t the first time that a northern city had been targeted for terrorism. In August 1864, Confederate agents had planned with the Sons of Liberty for an attack on the Union prison at Camp Douglas outside Chicago — to release Confederate prisoners. These northern Copperhead movements had failed to provide the needed assistance and the plot collapsed. The same problem had afflicted the Confederate plot to disrupt the New York City elections nine weeks later. After that failure, the Confederate agents were prepared to act alone. …one of Thompson’s messengers who traveled between Canada and Richmond, was also in our secret service, and the War Department was therefore frequently advised of the plans of the conspirators. This man had reported that the rumor mentioned in Consul Jackson’s letter of November 1, 1864, of a purpose to set fire to certain Northern cities was correct, but that the work would not be attempted on Election Day, November 8, but several weeks later; and that due notice would be given by him when the actual date was fixed. Later advices indicated the week after Thanksgiving as the probable time. Nothing further, however, being received from our spy, Major [Thomas] Eckert went to New York on Thanksgiving Day, November 24, and on the following morning called on Major-General Dix, commanding the Department of the East, for a conference. The latter had already been advised by Secretary Stanton of the machinations of the Confederate commissioners and their emissaries, but was wholly incredulous of the news about the burning of the city. With the aid of the police department of the city Dix had already used every available means to track the conspirators, but without success, and the scheme appeared so diabolical that he concluded it was wholly imaginary. Eckert tried to convince him, but could not, that there was solid ground for the rumors, and that the danger was not only real but imminent. Superintendent Kennedy and Inspector Murray of the police department were called in conference, and they too proved to be unbelievers. What Bates apparently did not know was that the leading Confederate conspirators narrowly escaped capture the day after the fires were set. They learned that Union officials knew all about their plot — and who was involved — as they were considering their plight over drinks at a Madison Square bar. 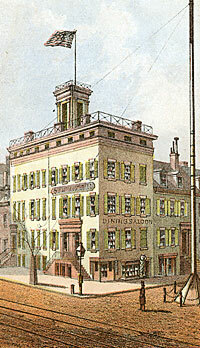 The finished their drinks, lingered in New York for two another days, and later escaped to Canada. Duane Schultz, The Dahlgren Affair, p. 229. Charles J. Rosebault, When Dana Was the Sun: A Story of Personal Journalism, p. 124. David Homer Bates, Lincoln in the Telegraph Office: Recollections of the United States Military Telegraph Corps during the Civil War, p. 299-300. David Homer Bates, Lincoln in the Telegraph Office: Recollections of the United States Military Telegraph Corps during the Civil War, p. 301-303. David Homer Bates, Lincoln in the Telegraph Office: Recollections of the United States Military Telegraph Corps during the Civil War, p. 305-306. David Homer Bates, Lincoln in the Telegraph Office: Recollections of the United States Military Telegraph Corps during the Civil War, p. 303-304. David Homer Bates, Lincoln in the Telegraph Office: Recollections of the United States Military Telegraph Corps during the Civil War, p. 304. Shelby Foote, The Civil War: A Narrative, Volume III, p. 725. Mr. Lincoln and New York © 2002-2019 The Lehrman Institute. All Rights Reserved.